Saudi Prince Mohd bin Salman Is Bringing His 'Boria Bister' To Pakistan For A Short Visit And And Kuch Reh Toh Nai Gaya? Saudi Prince Mohd bin Salman Is Bringing His ‘Boria Bister’ To Pakistan For A Short Visit And And Kuch Reh Toh Nai Gaya? It seems like the Naaya Pakistan is now in the process and the changes that we’re seeing are just pretty new. Although, with some glitches here and there – maybe we will get to the Naya Pakistan that we were promised. 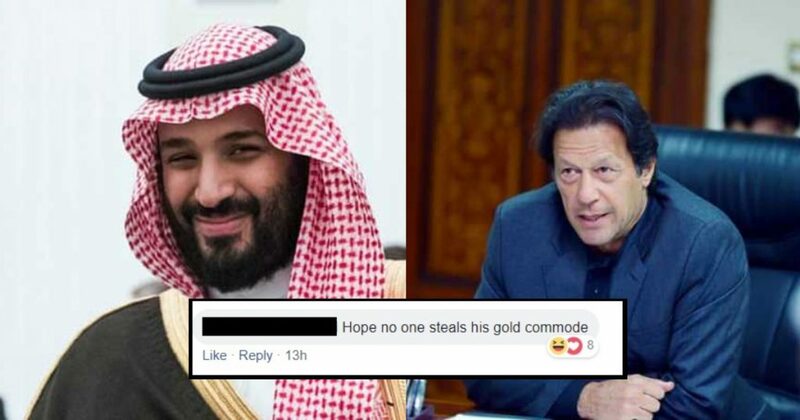 Recently, we learned that the Saudi Crown Prince Mohammad Bin Salman will be visiting Pakistan and we’re curious about this meetup. Just FYI – he’s even bringing his gym equipment… wow! The security team of Saudi Crown Prince Mohammad Bin Salman has arrived in Islamabad before his Pakistan visit. The officials visited different places in the Federal Capital and reviewed the security arrangements. The Saudi official may be staying at the PM House and a team of crown prince’s personal doctors and a delegation Saudi media persons have also arrived for the coverage of the event termed historic by both Pakistani and Saudi officials! According to details, Mohammad Bin Salman will arrive on a two-day visit on Feb 16 along with a large number of businessman and high-ranking officials. Here are a few of the important details about this entire meet up. Prime Minister Imran Khan will receive the guest at the airport. Saudi crown prince’s delegation will comprise about 1,100 officials and businessmen. Prince Muhammad bin Salman will be the guest of honor at international investment conference scheduled to be held here next week. A 40-member Saudi delegation and over 100 Saudi and Pakistani business leaders will attend the international event. Negotiations will also be held to attract Saudi investment in Bahawalpur solar plants, and power plants in Haveli Bahadur Shah and Bhikki. During the visit of the Saudi Crown Prince, both sides are ready to sign four memorandums of understanding (MoU) worth $15 billion. The government plans to provide 20-year tax holiday on the establishment of the oil refinery at Gwadar. A private businessmen delegation of over 40 CEOs of Aramco and other giants would be accompanying the crown prince in his upcoming visit. This is how people have responded to this change! This really cracked us up! And what do you all think? Na Maloom Afraad 2? Really? Okay, this is good sarcasm. So, in the end – is there anything the prince isn’t bringing with him? Let us know what do you think and expect from this trip in the comments below!